A network extension providing water access to 30,000 residents of Mombasa has now been completed, with the support of The Coca-Cola Foundation, County Government of Mombasa, Mombasa Water Supply and Sanitation Company (MOWASSCO) and Water & Sanitation for the Urban Poor (WSUP). The network was inaugurated at Mishomoroni Grounds in Kisauni Sub County today and attended by Mombasa Deputy Governor, Dr William Kingi. The partnership between The Coca-Cola Foundation, the County Government of Mombasa and WSUP is part of the Replenish Africa Initiative (RAIN), the Coca-Cola programme which aims to reach six (6) million people across the continent with improved access to safe water by the end of 2020. “This project has complemented us in our focus of extending connectivity to the residents of Mombasa County, currently not in our system”, said Mr. Francis K. Kombe, the Chief Officer; Department of Water, Sanitation and Natural Resource, County Government of Mombasa and acting MD of MOWASSCO. “This will in turn deter vandalism of our network system and consequently reduce our overall commercial losses”. 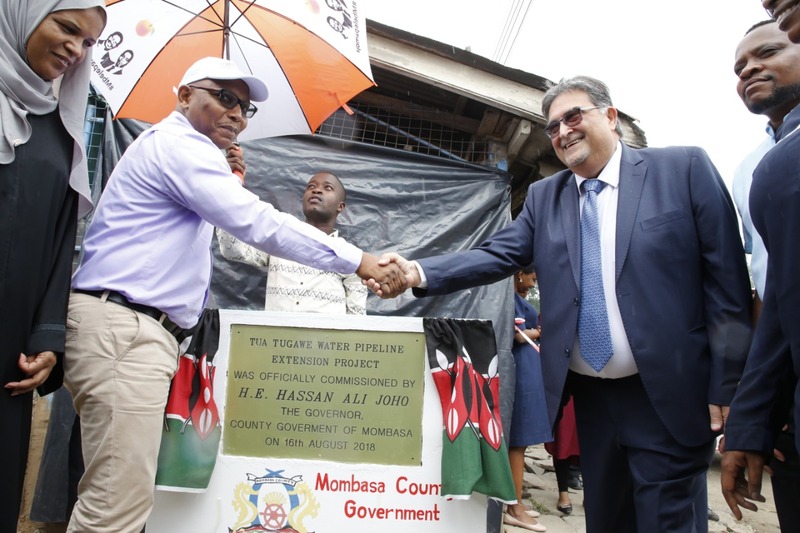 An investment of US$300,000 enabled the construction of five kilometres of pipeline which extends Mombasa’s existing water network into the Mjambere and Magogoni wards. Previously, residents were forced to buy water not safe for drinking from informal water vendors, often at a much higher price. 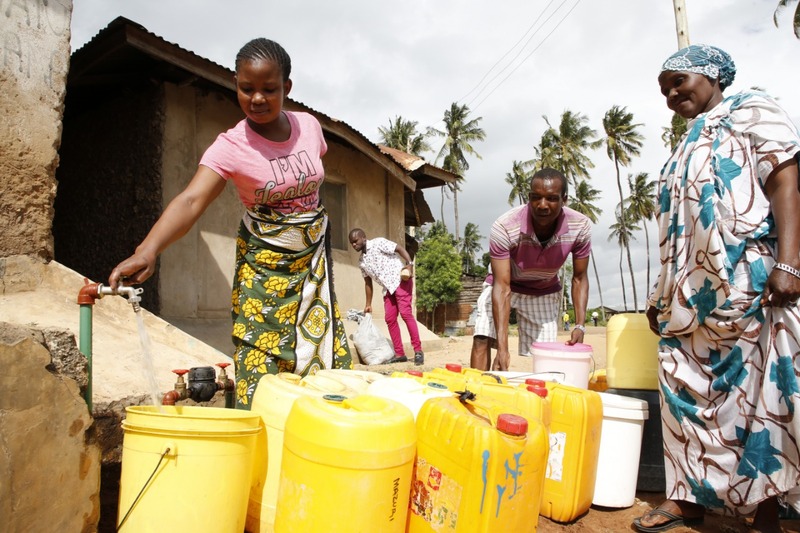 Mombasa is Kenya’s second largest city, with a population of just over one million – around two-thirds of which do not have regular access to safe, affordable water. Poverty levels are high in informal settlements, and young people in particular are at risk from drug abuse or radicalisation. The new pipeline, operated by MOWASSCO, will enable residents to connect to the water supply so that taps can either be situated in a yard or inside houses. Water from MOWASSCO will cost a tenth of what residents used to pay from water vendors. The construction of the water network was implemented by WSUP, which has worked in Mombasa since 2013. WSUP has provided long-term support to MOWASSCO, enabling it to improve its ability to serve low-income communities through activities such as reduction of leakage, improved billing, and strengthened engagement with residents. A key part of the project to extend the water network was engaging with local communities on the design of the network and promoting the benefits of access to safe water in terms of health, convenience and affordability. The Mombasa project is part of a wider partnership between WSUP and Coca-Cola, under the RAIN program umbrella. In Kenya, the partnership will benefit more than 330,000 urban residents, and across sub-Saharan Africa, it aims to improve water access for more than 1.5 million people by the end of 2020. The Tua Tugawe project was co-funded by UK aid from the Government of the United Kingdom and Kenya Markets Trust. Read more about WSUP’s work in Kenya.